#SOL17 10/31 Who Are You Online? Every teacher of diverse children (i.e. all teachers) should read this book. It is filled with honest insights that will have you checking yourself, your assumptions, and the language you use with students and families. 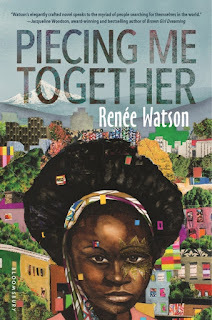 I am hoping to do a book club discussion of this book with some of my fellow teachers, so we can think about how best to support all of our students in being able to be their whole selves. The Hate U Give (2017) by Angie Thomas. The Hate U Give covers some of the same issues as Piecing Me Together (the mismatch between living in a poor, majority-black neighborhood while attending the wealthy white-majority school, figuring out how to be your authentic self, and more) and throws a strong dash of activism and a book-opening shooting of a young African-American teen by police. This book is also incredibly important and timely and should become a fixture of high school classes. 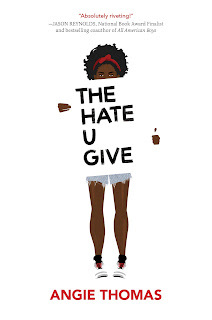 I am currently reading The Hate U Give. It has been a difficult but a necessary read! I also have American Street, but have not cracked it open yet. Will need to look into Piecing Me Together sounds like a better fit for my readers. I remember commuting over an hour each way from my neighbourhood to my private high school, and how jarring it felt. At school I was pitied and teased for being "poor", while at home I was teased and excluded for being "uppity" and wearing a uniform. It was hard enough, I can only imagine how jarring and frustrating it must be for young people when you add cultural and racial elements and tensions into the mix. Both of these are on my to read list. I'm just so swamped by other titles I have to get through first! Reading this makes it even harder to wait! I'll have to add both of these to my list. I've heard a lot about The Hate You Give, but not the other book. They both sound powerful. Love your idea of reading Piece Me Together with other teachers. Reading a children's book together sends so many important messages about how we can all learn from books. It would be amazing if you could video tape just a few minutes of the conversation for students to see. Would you mind if we linked to your post and featured your idea as a mentor teaching move on our blog? What a great idea to record some of it. Thanks! And yes, of course you can share & spread the teacher/admin book club idea too. I loved The Hate U Give and enjoyed American Street for it's portrayal of family and the immigration experience. It wasn't at the same level of THUG though. I am really looking forward to Piecing Me Together. Oh wow - these two books look like they are such powerful reads.